It's mission focuses solely on helping the youth of the community, says Caleb Lovelace, outgoing president of the Jennings County Youth for Development ...Read More. Jennings County sixth graders were treated to a trip that might very well have changed the decision of many students as to whether or not they would attend college ...Read More. Two mainstays at the Jennings County Community Foundation retired last week, citing the fact they felt it was just time to go ...Read More. Jennings County High School is redefining their approach to STEM (Science, Technology, Engineering and Math) education by creating a curriculum around an electric go kart ...Read More. Thursday, Jan. 18, employees of Erler Industries wholeheartedly embraced the work of the Jennings County Community Foundation with the announcement that 89 percent of its employees will now contribute weekly to the non-profit's work ...Read More. Community matters to the Jennings County Community Foundation. The nonprofit agency showed that last week when it distributed $10,000 to seven groups for a variety of projects as part of its 10th annual Competitive Community Grant Program ...Read More. Plans are being modified and bids will soon be taken for a new shelter house at the North Vernon City Park ...Read More. The Music Department is gearing up for another summer of the Stephen Collins Foster Music Camp, and we were recently reminded about how the Foster Experience now stretches across generations. John Williams, a junior euphonium player from Jennings County (IN) High School, will be attending his fourth season this summer. He states, "Foster Camp has been very important to me. It has helped me grow not only musically, but as an individual. I really enjoy meeting all the students from the other schools." Williams has recently joined with the Jennings County Community Foundation to create a scholarship program so that other students from his high school can attend Foster Camp. "My goal is to raise enough to support four band, four orchestra, and four vocal scholarships," notes Williams. "I want others to have the same opportunity that I have had and to also help our school's music program." 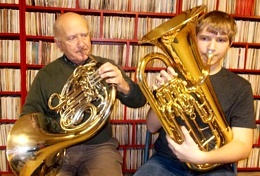 Williams is the grandson of Tom Taylor (BME '70, MA in Ed '73), who is a former EKU graduate assistant for bands, as well as former Band Director at the Model Lab School. Taylor served as the Administrative Assistant for Foster Camp during the summers of '72, '73, and '74. Persons wishing to support John's efforts may do so by clicking here then select "All Other Programs" and scroll down to "Foster Music Camp Scholarship Program." For the past seven years, the generosity and goodwill of the late Stan Snider has inspired and greatly assisted young people seeking to pursue their dream via higher education ...Read More. Local women with a shared purpose of helping children and families gathered late in May to award $3300 in grants to local organizations provided by their membership dues ...Read More. After seeing several nonprofit groups coming up empty handed last year, Laura Petri decided to put her money where her heart is ...Read More. The money will go for playground equipment, educational programs and helping victims of domestic violence, among others ...Read More. 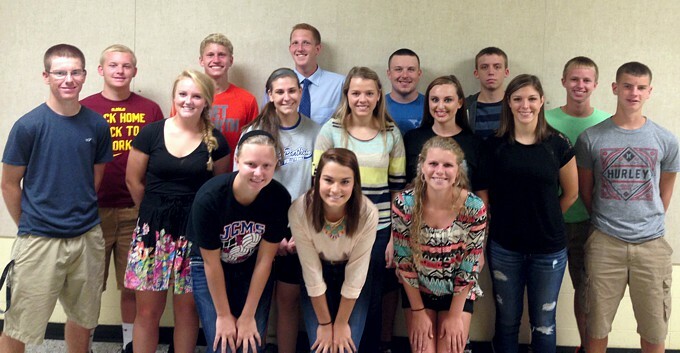 Meet the 2015/2016 Members of Jennings County Youth For Development. We are thrilled to have our new members on board, and equally excited to have our returning members back for another year! New playground equipment will soon be installed at two public parks, Muscatatuck and Eco Lake, both of which are owned and managed by Jennings County, that officials say are in great need of apparatus ...Read More. Eleven teenage girls went home with dreams fulfilled after the third annual Confidence Project concluded Saturday afternoon ...Read More. During his lifetime, Roger Simmons loved to be outdoors. He grew up on a 106-acre farm in Marion Township and later made a home on his own 300-acre farm in Sand Creek Township where he raised livestock, corn, soybeans and hay ...Read More. The timing could not have been better for the Jennings County Community Foundation (JCCF) to pause operations and give thanks for 20 years of continued growth and outreach to its hometown and county ...Read More. According to director Barb Shaw and board members, the Jennings County Community Foundation (JCCF) is excited to be a part of Giving Indiana Funds for Tomorrow (GIFT), a challenge grant of Lilly Endowment Inc ...Read More.